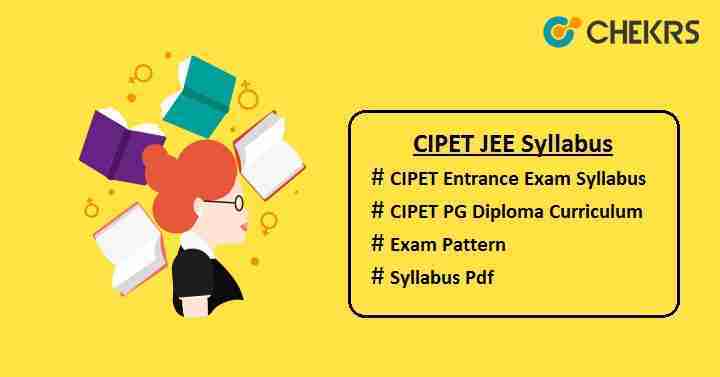 CIPET JEE Syllabus 2019: Central Institute of Plastics Engineering & Technology Joint Entrance Examination (CIPET JEE) is an entrance exam held at university level to provide admission in PG Diploma and Diploma courses in plastic construction, molding, processing and testing technology. CIPET will conduct CIPET JEE 2019 in the month of May for the candidates seeking admission into various courses for the academic session 2019-20. Those candidates, who will fill the CIPET JEE application form to get admission in diploma course, should go through the CIPET Entrance Exam Syllabus. For each entry level, CIPET JEE entrance examination courses will be different. For diploma courses, the syllabus will be comprised of the topics of class 11 & 12 of subjects namely Physics, Chemistry & Mathematics and also current affairs. For PG Diploma course, the topics covered in the examination will be according to the CIPET PG Diploma Curriculum prescribed by the CIPET including the General Awareness. Check out the CIPET Diploma Syllabus prescribed by the University for better preparation and also to get qualifying marks in the entrance test. CIPET JEE Exam Pattern will give the overview of question paper and those who will follow it, can get qualifying marks in the exam and able to give the entrance exam with better preparation. Here we have mentioned the Exam Pattern of CIPET JEE to help students to score good marks in the entrance exam. Students can get CIPET Sample Paper from the official site and can practice it to get good scores in the entrance examination. Practicing last year’s papers will help you improve speed and accuracy for the exam. Candidates can download the CIPET JEE Model Papers with solution in the pdf format and you can know the structure of the question papers. We have also published an article, with the procedure to download CIPET JEE Admit Card 2019. Check the Details and follow the procedure.